Amy's Creative Pursuits: New Embroidered Jeans! Before I begin, I apologize for the bad photography. My new DSLR was in the shop all week to have some repairs done so I had to use my IPhone. But, it's not suppose to be about the photography, but the fashion, right? Today I'm sharing an outfit I wore on my usual "Amy's Day Out" ha ha; that's what my husband calls it, as it's the one day of the week I leave my house other than Sundays. My usual day starts with a ladies bible study at my church, shopping, a meet up with my husband for lunch, and then home or more shopping. Sometimes I meet with a close friend, get my hair done, or other appointments. So, whatever I wear, it has to be comfy as it will be a long, eventful day. On the day I wore this outfit, it was in the 50's and drizzly. I wore an embroidered top from Stitch Fix (old), my new suede jacket from Stitch Fix (just got it in last month's Fix, see this post if you missed it), embroidered jeans with a frayed hem, and open toe booties. My embroidered jeans are one of five pair of jeans I picked up at our Younker's "Going Out Of Business Sale". I really got some sweet deals. The prices I paid for my jeans ranged from $3.33 to $16.00. 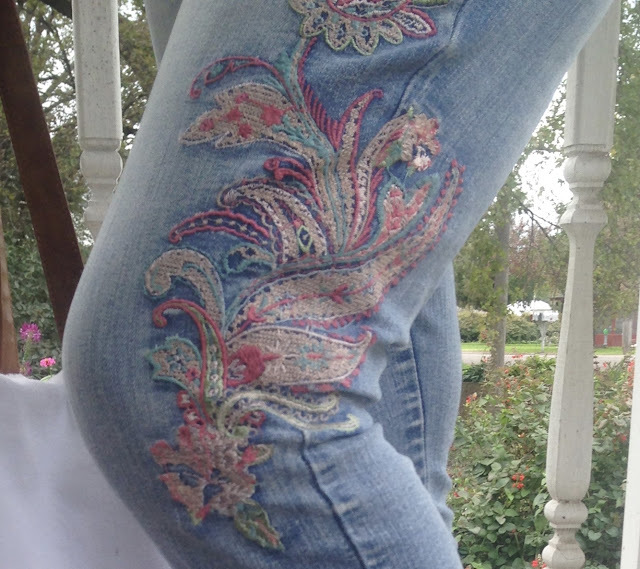 I've already shown you my Pom Pom Jeans and Pearl Embellished Jeans that I purchased from that sale, and now I get to show you this pretty embroidered pair. Isn't the embroidery pretty? I love the colors. It's embroidered on both legs, one leg has a large embroidered patch on the outer thigh, and the other leg has a smaller embroidered patch near the lower calf. I love the raw hem on the jeans. I really like this trend. My shoes are new this season, I got them from DSW. They are called Unisa Pryce Sandal. If I remember to photograph myself before I leave for the day, I post my outfit to Instagram Stories. I thought my Straw Studios Fringe Tote from DSW would go great with this outfit as it echoed the soft neutral palette. I received this embroidered top from Stitch Fix in 2015 and it's one of my favorite pieces in my closet. It's also one of the best items I ever got from Stitch Fix. I've gotten so much use out of it over the years. I just love the gauze fabric, the embroidery, the neutral color, and the cut of the top. It suits my body perfectly and this top goes with everything. It was worth every penny! Stitch Fix may be expensive, but if you're careful and keep just the right pieces, they can last you a very long time. For jewelry, I chose this simple choker. I felt there was already a lot going on in the top and with all the zippers on the coat, so the choker was the only thing needed. The choker color is very similar to the color of the coat, and I like the cute star charm. Well I got my camera back yesterday and it appears to be working. Hopefully, I'll be back in business with some better pictures next week! LOVE that jacket on you Amy! Thanks Andrea! 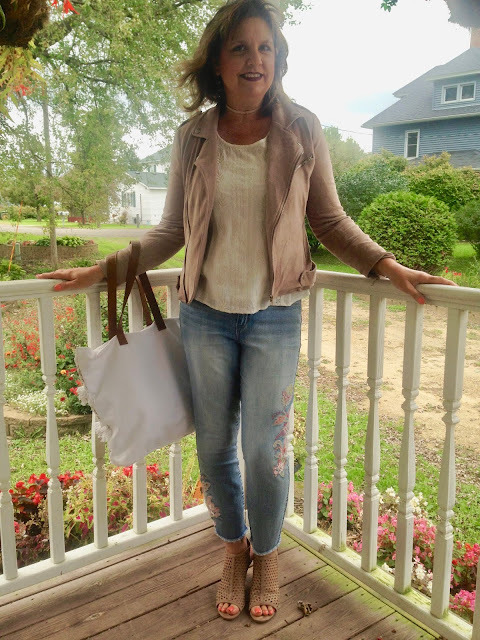 I'm so thrilled with this jacket from Stitch Fix. I love this whole outfit! Much of what you wear are the types of things I would wear. I'm not a fan of embellished jeans but I *will* say that this is the first pair of embroidered jeans that I really, really like! The embroidery on pattern is just beautiful it. Thanks Sarah! I feel the same based on the looks I've seen you wear. But I do love embellished jeans and own quite a few of them. Really love the details on the jeans here, they fit you perfectly! Your sandals also look so incredibly comfy! Those jeans look fabulous! Very good look! Enjoy your weekend. Thanks Nancy! I did! We had a great weekend with the kids. Love the soft palette of your outfit and the washed look of the denim. Great outfit to Amy's Day Out! Hugs, x. Thank you! I think I'm drawn to softer palettes. I hope you get your camera back soon. I'm sure that is so frustrating. Your jeans are so much fun and I love the top you paired with it! Thanks. I got it back. It's working again, but unfortunately I had no time to take new fashion photos for this week. I love this outfit. Those jeans are fabulous!! I have a couple of pairs of embellished jeans but I’m never sure how to wear them = I like the neutral pallet. Thank you. They are trickier to wear because you have to make sure what else your wearing doesn't clash with the colors in the embroidery. But, other than that, I wear them like I would any other pair of jeans. Lovely casual outfit! 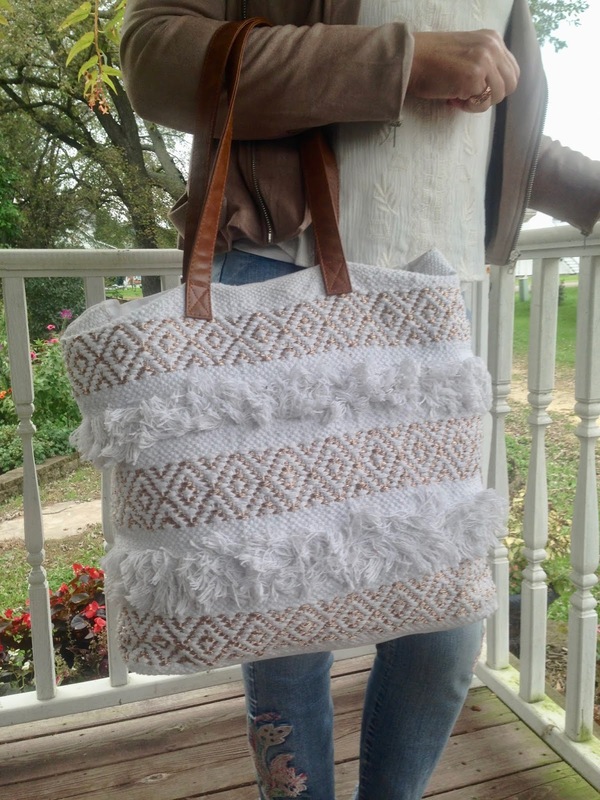 I really like embroidery, it's a cute detail and it looks fab on your bag, top and jeans here! Sounds like a busy but fun day too. Hope that you are having a lovely weekend! It's going to be a rainy one here! thanks Mica! It won't stop raining here either. It's been raining for weeks, and this week is full of rain again too. So depressing. Lovely look dear. Chic details on your jeans. Cute shoes too. A really cute outfit Amy. And the colors work so well together. I don't own any embroidered jeans but this outfit would totally be something I'd wear, minus the heeled booties. I just can't wear anything with any heels. Thanks Ellie! It's not easy for me to wear heels either, but I can't stand the way I look in flats. I don't know why, I think everyone else looks so cute in flats, but not me. I found the type of heel matters a lot: the chunkier the better (or a wedge) and I have to make sure the arch is not too high. Those jeans are perfect, Amy. I've been looking for a pair, but I haven't wanted to pay a lot for them, since I'm not sure how long they'll be around!! But you always get such great deals!! Thanks Jodie! They've been around for a couple of seasons now, we will see what the longevity is soon! Perfect look for your day out. Love the jeans and your cute shoes. Sometimes we get a top that never really goes out of style, like this one. Why would we get rid of it when it goes with some much. I absolutely love the frayed hem and the embroidery adds so much fun detail to play around with in colors and patterns that we pair with them. So true! I'm sure I'll have this top forever! Thanks so much! I love the embroidered jeans! And I love the timeless pieces your paired them with! Love these looks, and your choker! The shoes are pretty too, I am waiting on a pair of peep toes. Those jeans look so fun and I love different hems, styles on denim. So many embroidered jeans out there but these are really beautiful. Good pick, Amy! Well, I think your iphone did a pretty darn good job. Thats all I have is an Iphone. I do the best I can. I love the embroiderd jeans. You look darling in this outfit. Oh, thank you! My iPhone is a 5 so it's camera technology is a little outdated. It definitely isn't as clear as a dslr. 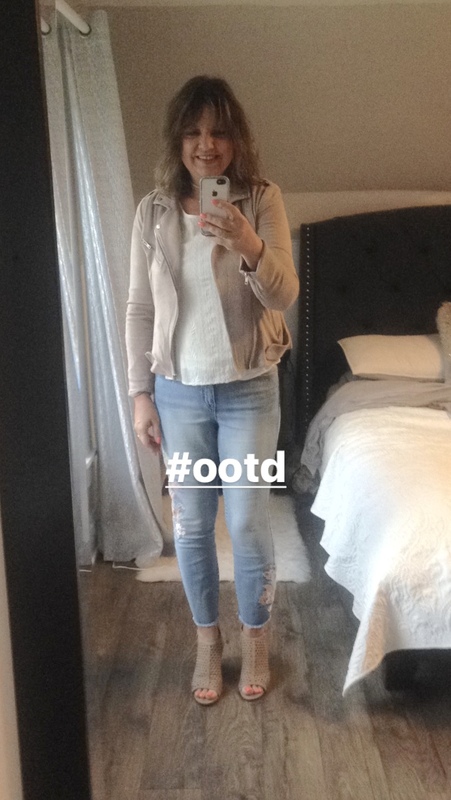 I'm loving the soft neutral tones of this outfit!